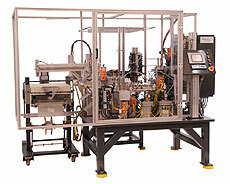 Automated gluing systems are used for a wide variety of applications, including housings, doors, etc. These systems also work with a wide variety of materials, including foam, plastics and many more. Automated gluing systems often use UV glue that requires UV light for the glue to cure, but many other types of glue can also be used. Dial-X Automated Equipment, Inc. has the experience and flexibility to meet your exact gluing system needs. For further information or a free quote on automated gluing systems, contact Dial-X Automated Equipment, Inc.